Today, I was looking at flights for a business trip and I thought I would share my favorite travel site: SideStep.com. It searches multiple travel sites to help you find the best deal, but it is really the interface that makes me like it so much. I've never used another site that lets you adjust so many preferences (layover time, layover airport, etc) but it also shows you the effect of your preference on price before you make it and updates your results in real time. You, also, can get results for nearby airports and flexible dates. I think you may need to register for some of the features, but it is worth it. Today was my last shift as an ODIN (Onboard Data Interfaces and Networks) Officer for the International Space Station (ISS) supporting a shuttle flight. It was bitter-sweet. The timing of my move out of the world of flight control was definitely right with a baby on the way and a desire to focus on other things in my life, but it’s a hard world to leave. Fortunately, I’ll still be supporting the ODIN console as needed during increment operations, which is the time between shuttle flights, so they haven’t completely gotten rid of me yet. This flight was a special one to me for many reasons. I was the Lead ODIN for this mission, so I have spent several years planning and training for it. It was the mission where our European Space Agency (ESA) partners attached their first module, Columbus, to the ISS. They have been a privilege to work with, and I have been very proud of their performance as flight controllers. This mission did not exactly go according to plan, especially for the ODIN system. During the activation of the Columbus computer systems, the US computers encountered a software problem that brought the activation of this new module to a halt. The teams worked together beautifully to resolve this and other computer problems that occurred in both the US and ESA systems. Once resolved, the module was activated, and the teams were able to celebrate briefly before getting back to work. This mission also became more important to me after attending International Space University’s Summer Session Program in 2006. I spent the summer working with several members of the ESA team and people from countries all over the world. With the activation of the ESA Columbus module and the JAXA module that is planned to be launched in April, the ISS is finally coming together and bringing people all over the world together as a result. Finally, as the ODIN lead for this flight I had the opportunity to work with a great group of people internally at NASA. I couldn’t have hoped for a better team. 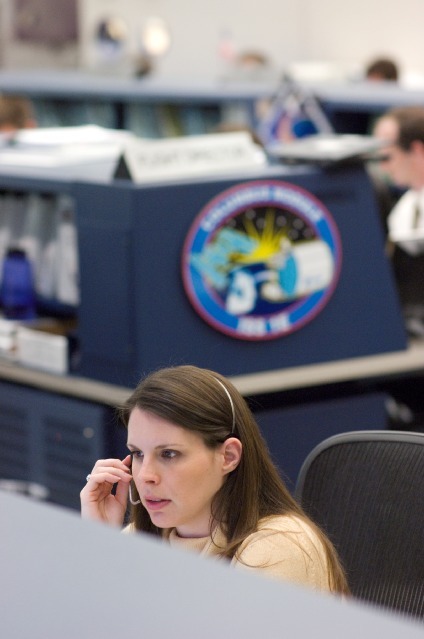 To top that off, this mission turned out to be the last one for my lead Flight Director, Sally Davis, as well. Sally celebrated her 400th shift as an ISS Flight Director during this mission, but she has worked over 1000 shifts throughout her career. She is not leaving NASA but moving on to a different role. She has commanded great respect throughout the time I have known her, and I am proud to have worked under her guidance. It’s been quite a mission! I spent the vast majority of the day today hanging 3 new fans. Elizabeth has hated our fans since we moved in and we've just been putting it off. After putting one up in Jackson's room a couple of weeks ago, we realized that it isn't that big of a deal. We got the 52" Harbor Breeze Tiempo in white (first picture) for the living room and our bedroom and the 42" Harbor Breeze Cheshire in white for the guest room (second picture), which is also what we put in the baby room. I've definitely come to the conclusion that, if you want to make a quick update to your home to sell or just so that it feels newer and you only have a few hundred dollars to spend, the best bang for the buck is paint, fans, light fixtures, and shower heads. These things are relatively inexpensive and make a huge impact. Today, I completed the bed side tables for our bedroom (previous post), hung them on the wall, and wired up the integrated lamps. I know it sounds a little strange, but it is all part of the headboard design that Elizabeth came up with. This post has a lot of implementation details on the bed side tables. Also, the picture includes the photographs that we hung some time ago but haven't posted a picture of until now. This morning, I put the last coat of polyurethane on the bed side tables. I have to say that staining and applying polyurethane are among my least favorite activities. Anyway, I decided to finish the wood before assembling, so I taped off the areas that will get glue and I'll be putting everything together tomorrow. Hopefully, I'll have pictures soon. While Ross was in New Orleans last week, I spent my free time painting Jackson's room. It took the entire week to get it done because I only had a few hours here and there. My friend Natalie came over one day to help, and I was certainly grateful! I think it turned out pretty well. Now we're just waiting on furniture to arrive so it starts to look like a nursery. The crib and glider have both been ordered, and we're working on designs for the bookshelf and dresser. E and I have gotten addicted to Spider Solitaire recently and after consistently improving, I thought it was time to take on the difficult level. Well, tonight I get my life back because I finally won! It didn't come easy...our two computers show 55 losses to 1 win in the statistics and I'm pretty sure I've played many more games on other computers but I'm going out on top. I officially announce my retirement from Spider Solitaire, effective immediately.